"41: I like the competition. And the loyalty to the home team. - 44"
Former Presidents Barack Obama, left, and George H.W. Bush. 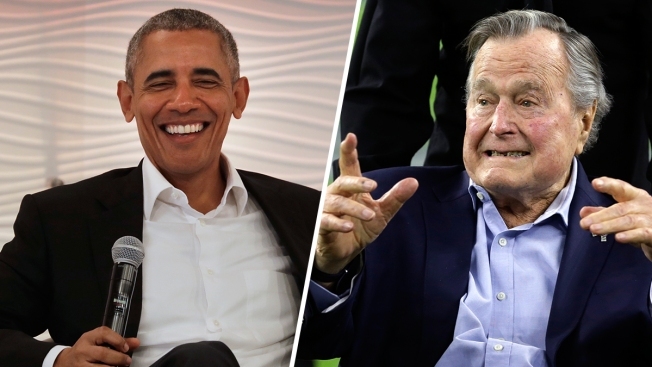 Obama and Bush have a friendly competition over their NCAA Tournament brackets. Barack Obama and George H.W. Bush both filled out NCAA Men's Basketball Tournament brackets, and their predictions could not be more different. The 44th president picked Michigan State, while the 41st has Texas A&M winning the championship title. Bush tweeted he is "respectfully differing" with Obama and believed the Aggies "are going the distance." Obama tweeted back, "41: I like the competition. And the loyalty to the home team. - 44"
Bush, a Texas resident, chose the Aggies to top Michigan and Xavier on their way to the Final Four, where they'll join Virginia, Villanova and Duke. He then has Texas A&M over top-seeded Virginia in the semifinials, finally beating out Villanova for the championship. Obama tweeted congratulations to 11th-seed Loyola Chicago after it upset sixth-seed Miami and wrote, "I had faith in my pick!" He has the Spartans beating Bucknell, Syracuse, Duke and top-seeded Kansas to reach the Final Four, along with defending national champion North Carolina, Villanova and Virginia. Then he has Michigan State beating out Villanova in the national semifinals and finally defeating Virginia, the tournament's top seed, for the national championship. "Just because I have more time to watch games doesn't mean my picks will be better," Obama tweeted Wednesday. Obama also tweeted out a bracket for the women's tournament — he expects top-seeded UConn to win the title. The Huskies had their 111-game winning streak snapped by Mississippi State in last year's Final Four. Last year Obama accurately predicted the tournament win for the North Carolina Tar Heels. President Donald Trump did not publicly release a bracket. He declined an invitation last year from ESPN to do so on-air, a tradition Obama partook in during his presidency.